Episode 156, December 8, 2015. Tales of Vinnie Vincent, Wigs and Crazy Nights with Alexx Michael, all the way from Germany! Alexx has many stories from the European KISS Expo tour in the 90s which featured Vinnie Vincent as special guest. Oh man you won't believe what Alexx tells us! Make sure your wigs are on straight, lol! Since launching a year ago Three Sides of the Coin has been ... See More viewed or listened to over 1,000,000 times. 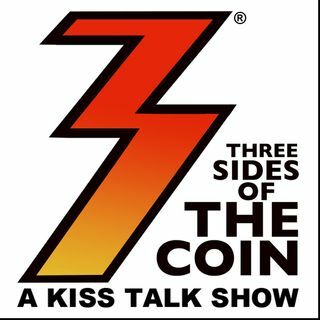 In the last year, Three Sides of the Coin has been joined by special guests including former KISS lead guitarist Bruce Kulick, the Black Veil Brides' Andy Biersack, Frank Munoz associate producer for Ace Frehley's Anomaly album, award winning songwriter Adam Mitchell, Ed Kanon (Peter Criss' drum tech), and Kevin Valentine (drummer on KISS' Psycho Circus album). Three Sides of the Coin was recently picked (October 2013) as a 'What's Hot' podcast by Apple's iTunes. In the early '90s, Michael Brandvold launched the fifth ever website on the Internet devoted to KISS, KISS Otaku. He built, launched and maintained Kissonline.com (KISS' official web presence). He now owns Michael Brandvold Marketing, providing providing marketing services and digital strategy to musicians. Tommy Sommers spent 15 years on the record show circuit collecting, trading and selling memorabilia / Kiss merchandise. He is now a successful residential Real Estate agent in the Minneapolis / St. Paul area. Tommy has also produced a KISS song For The Oddfathers and is the owner of Rock Steady Digital Photography. Mark Cicchini, is a world renown KISS collector. KISS have used parts of Mark’s vast KISS collection for audio, video & print materials including their book NOTHIN TO LOSE, CD re release of the LOVE GUN album & the VH1 Ultimate Album KISS ALIVE! special as well as many other KISS projects. His wife also makes a mean meatloaf!! !